Part 4 includes: – Workout continued from part C – calves, Meal break and then abs, Home gym workout shoulders, Posing in gym in trunks, plus lifestyle segments. The first part of this video was shot on July 9th and 10th 2007 on Ronnie’s final off-season week. This was 12 weeks out from the 2007 Olympia. 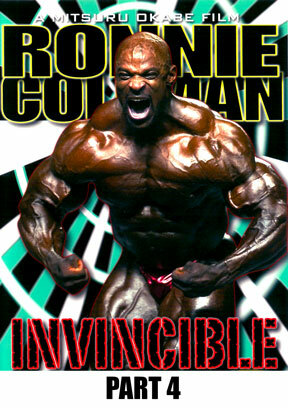 Then more taping again on September 3rd and 4th, 2007 – just 3 weeks out from last year’s Olympia. The video includes a final body check by Ronnie’s nutritionist Chad Nicholls on the day of the Olympia, September 28th, 2007 in his hotel room. Ronnie mentions that his diet has changed from last year and explains how and why. His weight training regime has also changed. All training sessions were shot at Big Ron’s home gym in Texas. Ronnie speaks out I & II. How he got his pro card. (14mins ). Olympia Contest footage not included.